Focusing on ‘Preparing The Bride for the Time of the End’. Teachings will be on understanding and experiencing miracles, healings, signs and wonders, glory presence, visitations, and encounters during these times of corporate worship and intercession, prophetic declarations and appeals to Heaven for our land. A new expression of a mighty outpouring of the Holy Spirit (Joel 2:28/Acts 2) is upon us. Many of these demonstrations are recorded throughout Church history, however, none has been termed the “Bride’s Revival”. These sessions began in June, 2016 after receiving multiple prophetic words and confirmations about the need to prepare for the “Time of the End”. 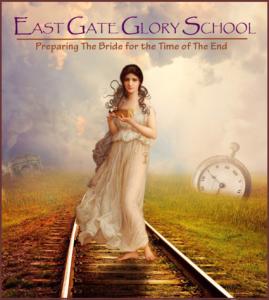 When stepping out to launch the East Gate Glory School (also named by Heaven in a prophetic word), we came across a random illustration [to the right] that actually contained many of the elements in the directions we received. Over the course of the sessions in 2016-2017, we unpacked the meaning of the symbolism contained within this depiction. Review the prophetic work of Bob Jones’ vision of the Glory Train and “time capsule” shaped like an egg. This word is re-counted on Bob’s website commemorating his 85th birthday in 2015. Click here to read the prophetic word. Listen to R.T. Kendall – “The Midnight Cry “- Last Call to the Awakened Church Click here to access video.